I just attended the Hollywood premiere of Iron Man 3 and it's every bit as good as I expected it to be! The newest Iron Man 3 clip that's out there for you to watch is Nothing Has Been the Same Since New York. Even after seeing the movie it still gave me a little lump in my throat. The last clip I wrote about, Tony Calls Out the Mandarin, emphasized Tony Stark's confidence and power. 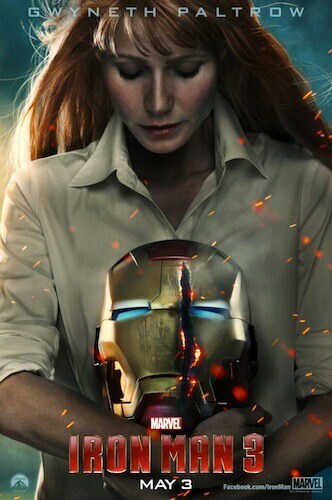 This clip really shows Stark's vulnerable side, and it shows the love between him and Pepper Potts. Awww…that was tender. Makes me wish my hubby was home from overseas 🙂 Thanks for sharing. It’s a good reminder that Tony Stark is a man first. It totally is a great reminder of the depth of Tony Stark’s character! This movie is gonna be the biggest summer blockbuster–I saw it last night and it was astounding! If you doubt it then you’re in for a rude awakening.. I totally agree! There were times when I swear I was holding my breath and I didn’t even know I was doing it.